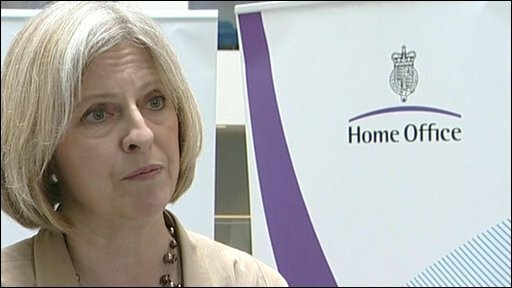 Theresa May: "We didn't believe ID cards would work"
The National Identity Card scheme will be abolished within 100 days with all cards becoming invalid, Home Secretary Theresa May has said. Legislation to axe the scheme will be the first put before parliament by the new government - with a target of it becoming law by August. The 15,000 people who voluntarily paid £30 for a card since the 2009 roll out in Manchester will not get a refund. Ms May said ID card holders would at least have a "souvenir" of the scheme. The Labour scheme was aimed at tackling fraud, illegal immigration and identity theft - but it was criticised for being too expensive and an infringement of civil liberties. The cards were designed to hold personal biometric data on an encrypted chip, including name, a photograph and fingerprints. The supporting National Identity Register was designed to hold up to 50 pieces of information. The cards already in circulation will remain legal until Parliament has passed the legislation to abolish them and the register. The short abolition bill will be pushed through Parliament as quickly as possible with the aim of cards being invalid by 3 September. Anyone who has a card or has to deal with them, such as airport security officials, will be told the termination date in writing. Once the cards are illegal, the National Identity Register will be "physically destroyed", say ministers. Some 60 people who were working on the scheme for the Identity and Passport Service in Durham have lost their jobs. Ms May said: "This bill is a first step of many that this government is taking to reduce the control of the state over decent, law-abiding people and hand power back to them. With swift Parliamentary approval, we aim to consign identity cards and the intrusive ID card scheme to history within 100 days." Officials are renegotiating two contracts worth £650m with companies who had agreed to deliver parts of the scheme. It's not clear how much the government will need to pay compensation, but officials say there is no "poisoned pill" in the deals and they expect to save £86m once all exit costs are met. Some £250m was spent on developing the national ID programme over eight years and its abolition will mean the government will avoid spending a further £800m over a decade. Former Labour Home Secretary David Blunkett unveiled plans for an identity card scheme in July 2002. By February 2010, the scheme's costs over its lifetime had ballooned to an estimated £4.5bn. Despite the demise of the national identity card, a separate but technically similar scheme for some foreign nationals will continue. That scheme, run by the UK Border Agency, is still being rolled out. Immigration minister Damian Green said the scheme was an EU obligation and that the previous Labour government had rolled it into the main ID card programme. Some 200,000 of these cards, now known as biometric resident permits, have already been given to migrant workers, foreign students and family members from outside the European Economic Area. British passports are about to be upgraded to a new international security standard but additional proposals to put more biometric information on in the future have also been axed. 3. Citizenship. Foreign nationals in the UK are being given different cards.